Early on Saturday, I made my way to Mayfair. 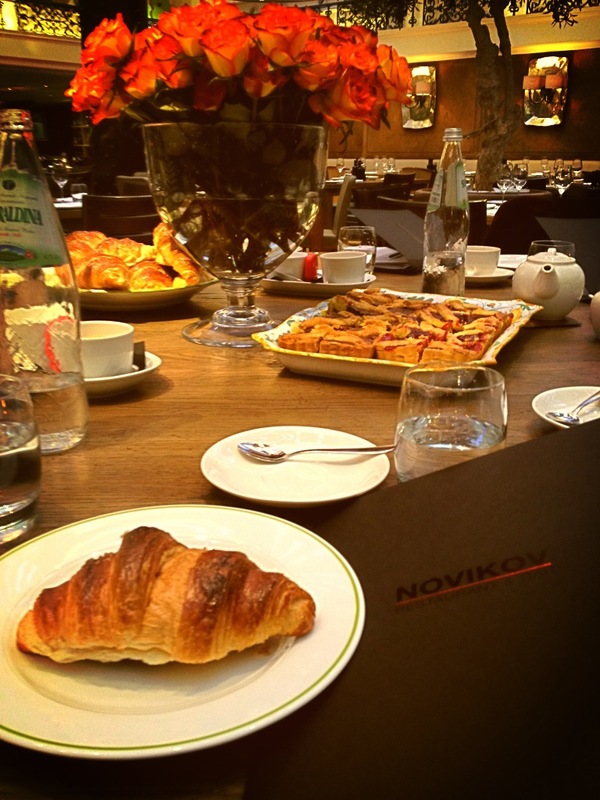 I couldn’t possibly turn down a media invite for an Italian Cooking Masterclass at the beautiful Novikov. The restaurant is massive and is separated into the dark Asian room serving Chinese & Pan-Asian delicacies and the light and airy Tuscan designed Italian room serving traditional Italian classics. We met in the Italian Room at a large round table in the centre of the empty restaurant. The table was topped with a stunning bouquet of orange tipped roses and had a delicious spread of fresh croissants, chocolate & hazelnut crostata and a crostata filled with fresh cherry jam – all of which were divine. We munched on baked goods, observed the beautiful kitchen, and got to know one another over coffees & teas. Then it was time to get our hands dirty. 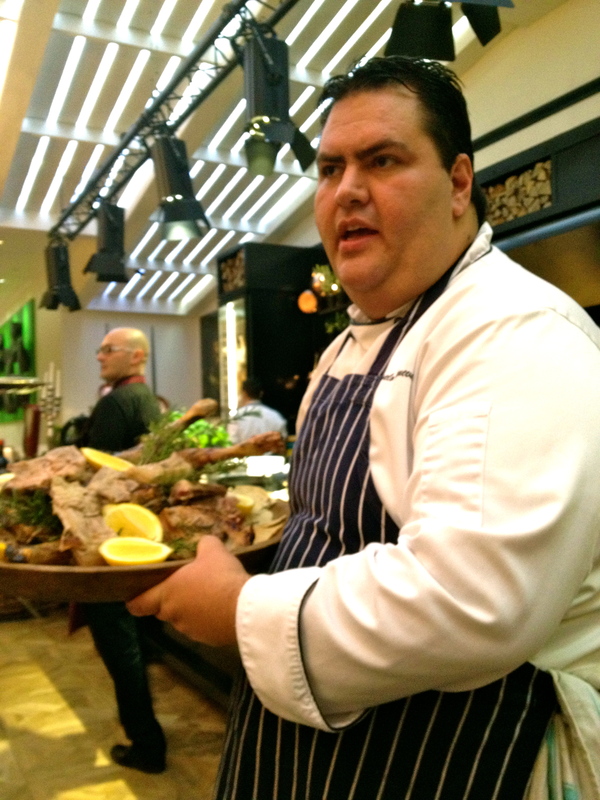 Chef Whites and aprons on, we were separated into three groups: antipasti, lamb and sides & desserts. I was on sides & desserts. 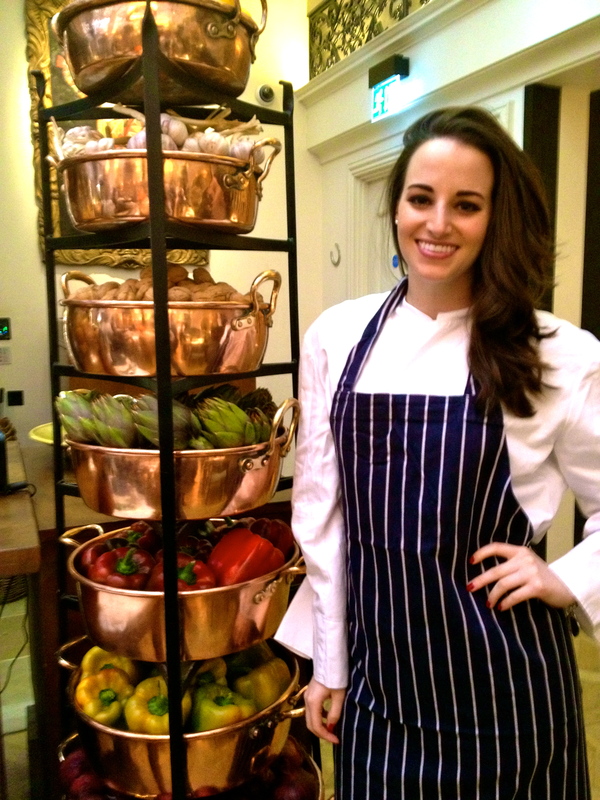 You can call me Chef Alessandra ’cause I was made for those Chef Whites. 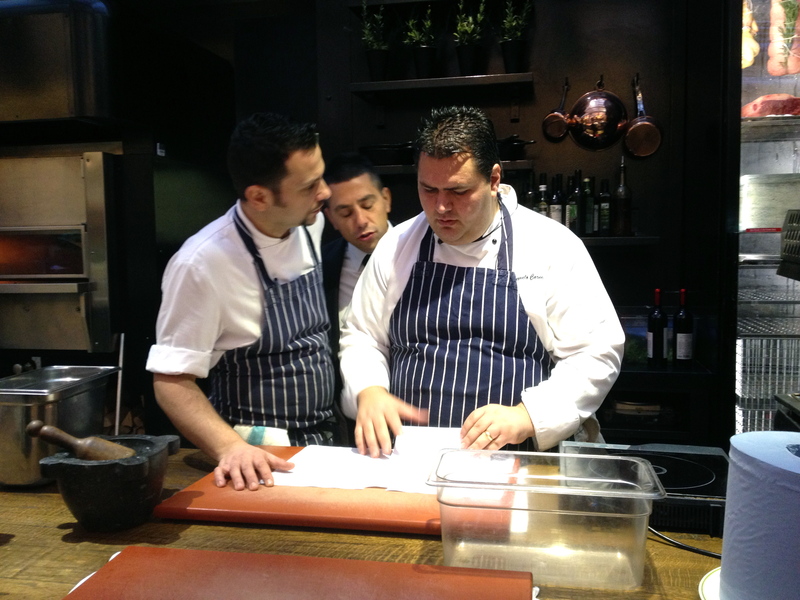 All three of the chefs hailed from different parts of Italy and playfully bickered at each other in dialects throughout the day. The first crew set off to tackle their antipasti. The first dish out of the oven was a Cavolo nero tart with Pecorino cheese. 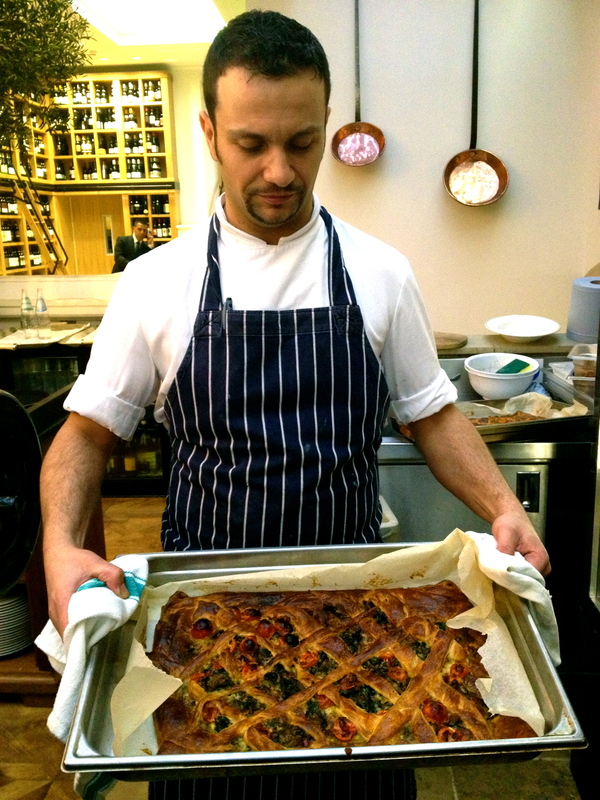 This was a beautiful puff pastry topped with pesto, Pecorino, cherry tomatoes, chili and cavolo nero Italian cabbage. 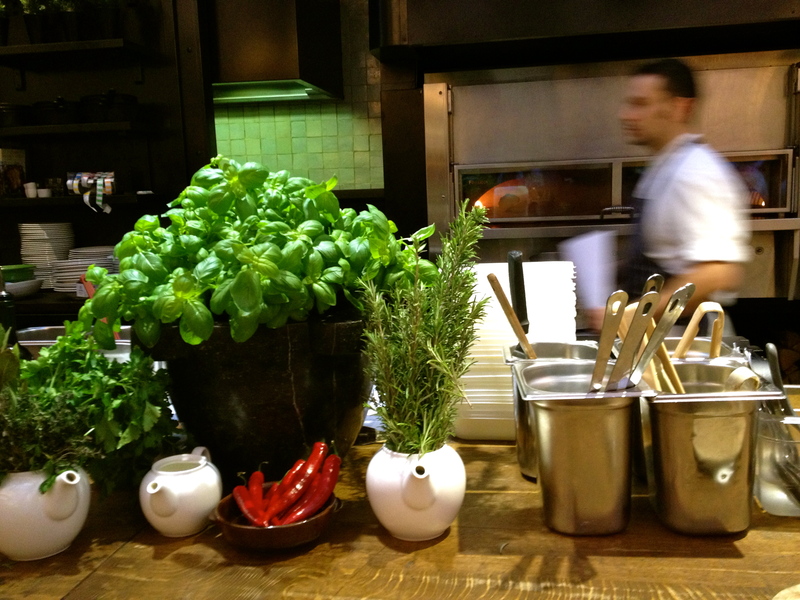 Wouldn’t you love to have such a beautiful basil plant in your kitchen? 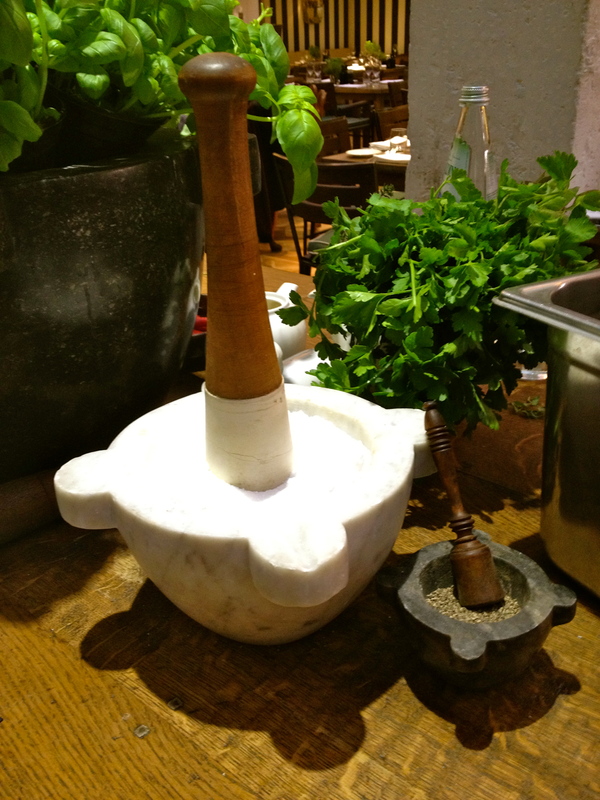 And how about these mortar & pestles for the salt & pepper? 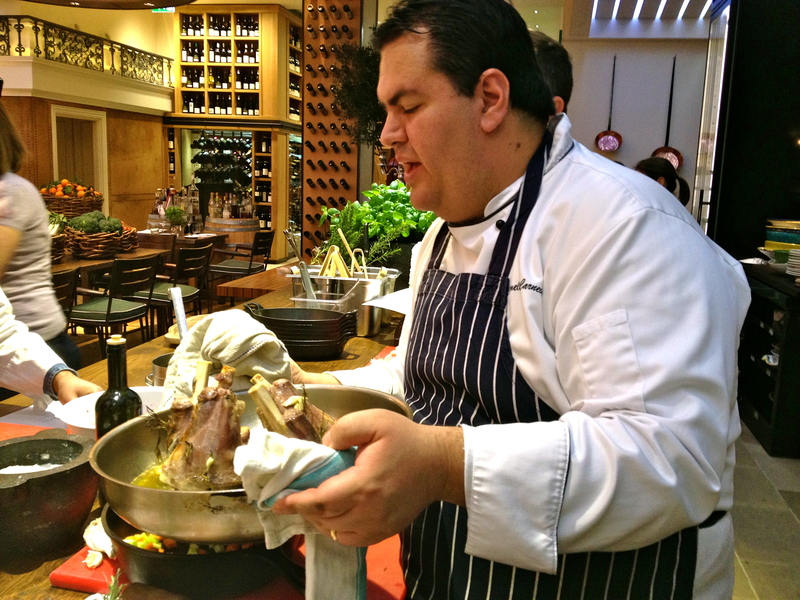 Working with Chef Carmelo, the lamb group began the task of cooking lamb three different ways. First was butterfly roasted Sardinian lamb. 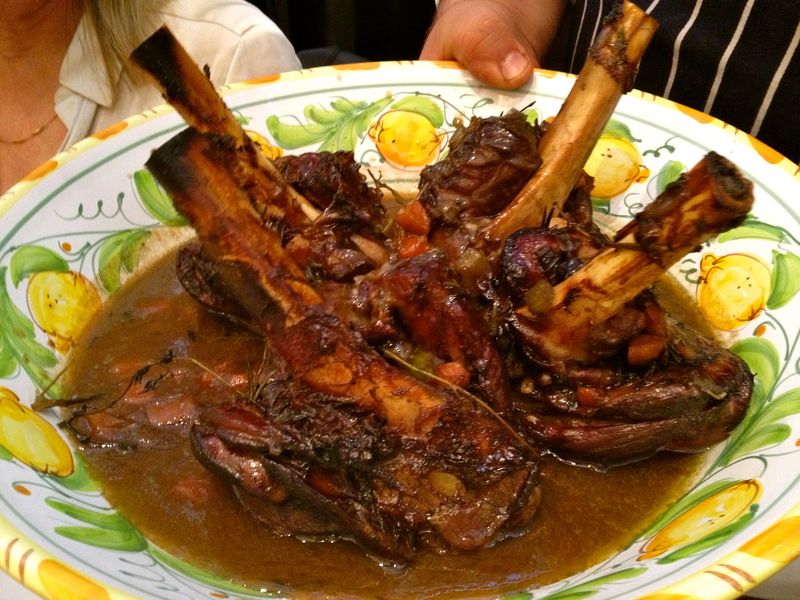 Then slow cooked lamb shank in chianti red wine. Would you like a napkin? 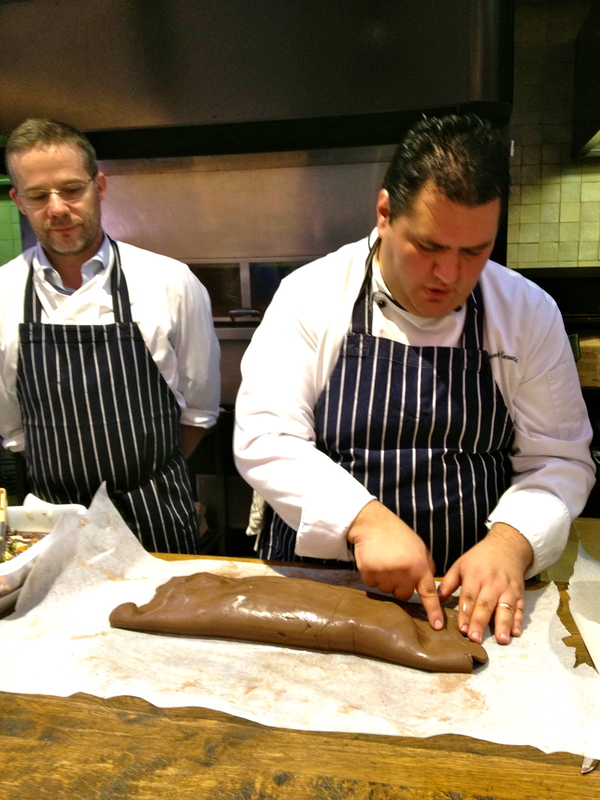 You’re drooling… And last, slow cooked lamb in clay. 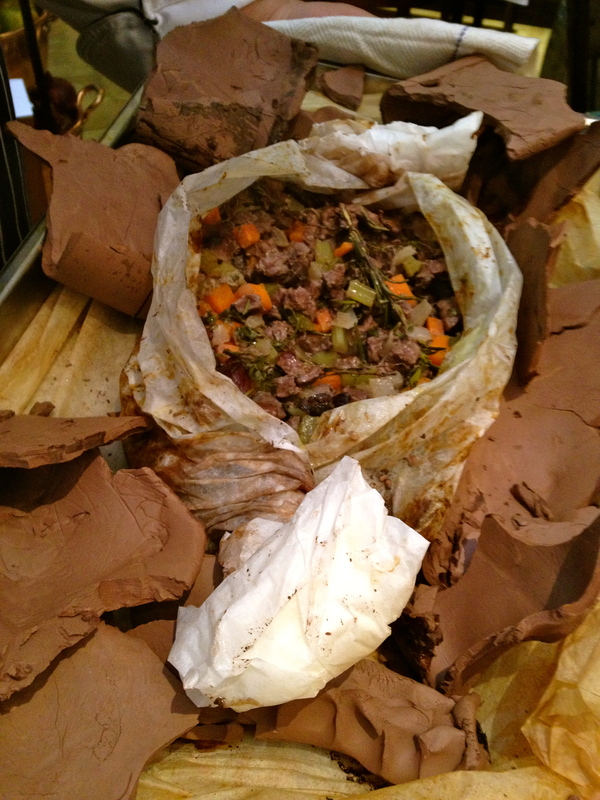 For this, Chef Carmelo placed lamb chunks in parchment paper and surrounded the paper in a fold of clay. And you thought Arts & Crafts and Cooking didn’t mix. 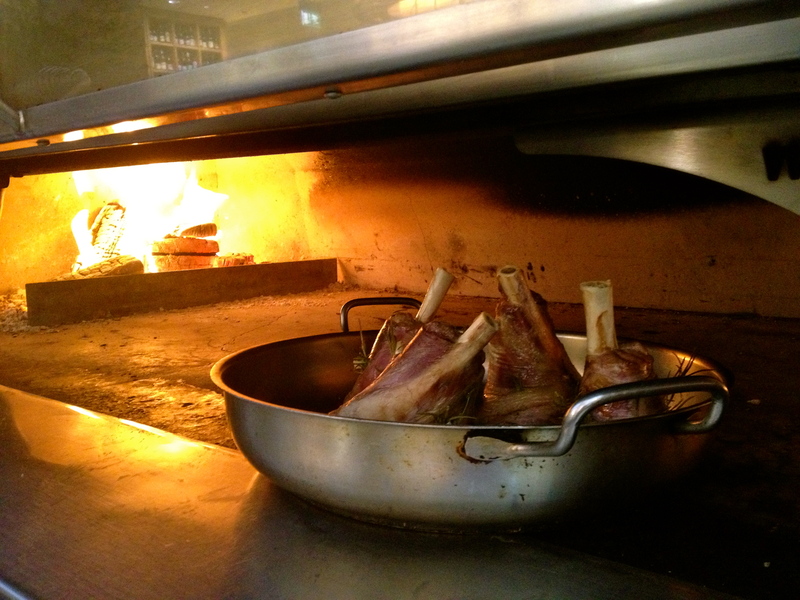 This was then baked in the fire oven and cracked open to reveal perfectly cooked, tender lamb. My group took on the sides. 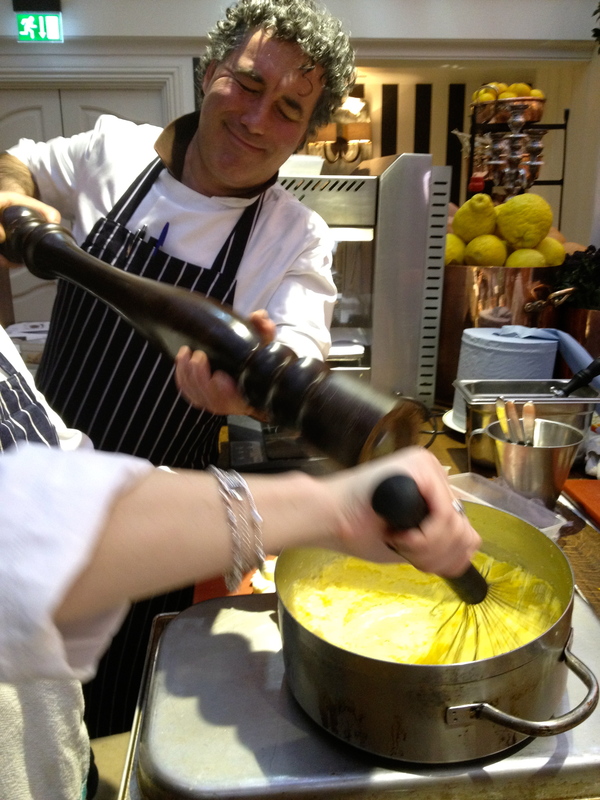 First we whipped up some polenta in boiling water. 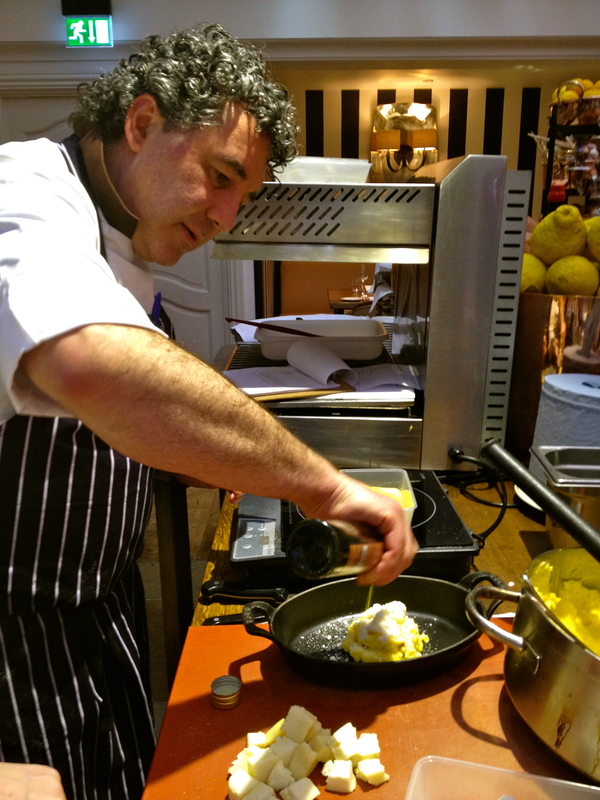 Chef Micheli was busy laughing at one of Carmelo’s jokes about Northern Italians as he added a dash of pepper to the boiled polenta. 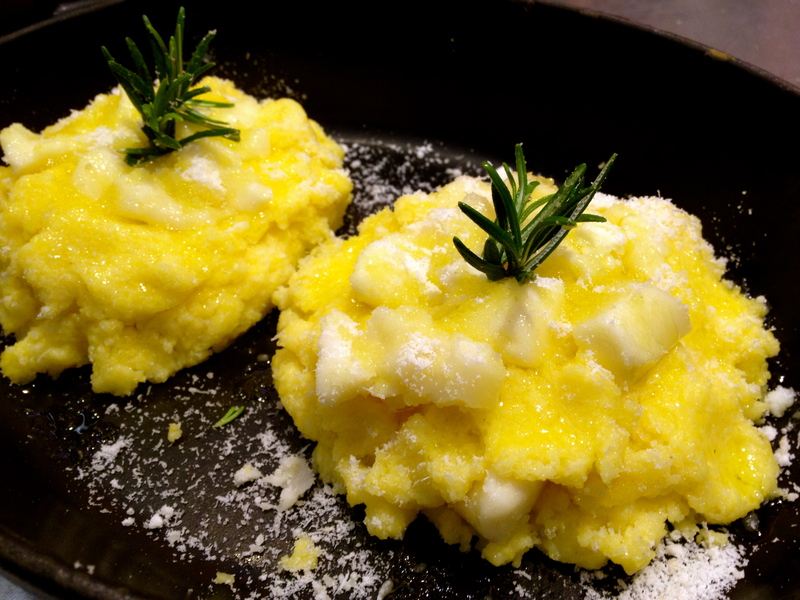 The polenta was then shaped however we wanted in a dish. I made a sort of polenta tower which was layered with salty chunks of Taleggio and topped with grated parmesan and a glug of olive oil. The creamy, cheesy mixture was then sent to the oven to bake until all the cheese melted into a gooey, beautiful mixture. Whilst our polenta baked, we made a salad of pan-fried aubergines with sautéed shallots, fresh rocket and toasted almonds. I’m sure you’ve always wondered how a giant would season his dinner. To finish off the feast, we made Sicilian ricotta mousse with amaretto and oranges. 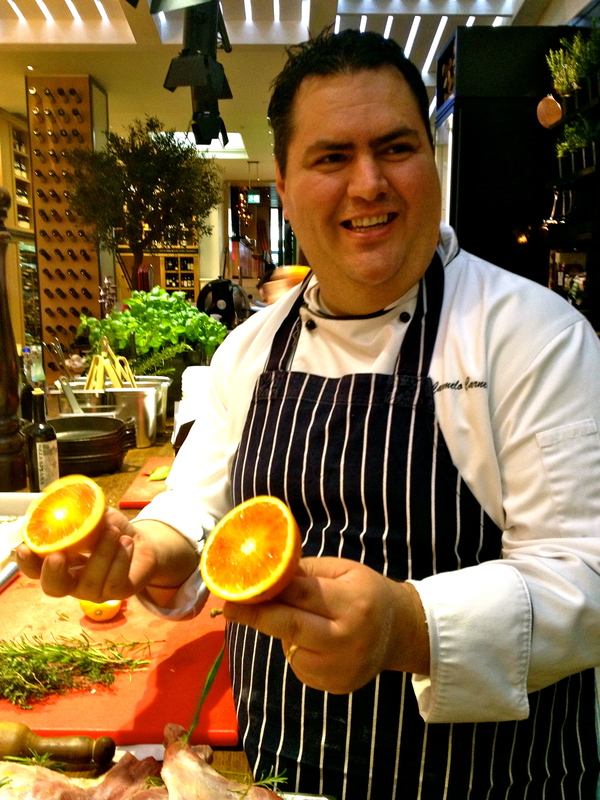 Chef Carmelo was excited to tell us that these blood oranges had been imported all the way from Sicily. First we segmented the oranges, which were beautiful in colour and resembled stain glass windows. Then we zest the peel of the orange. 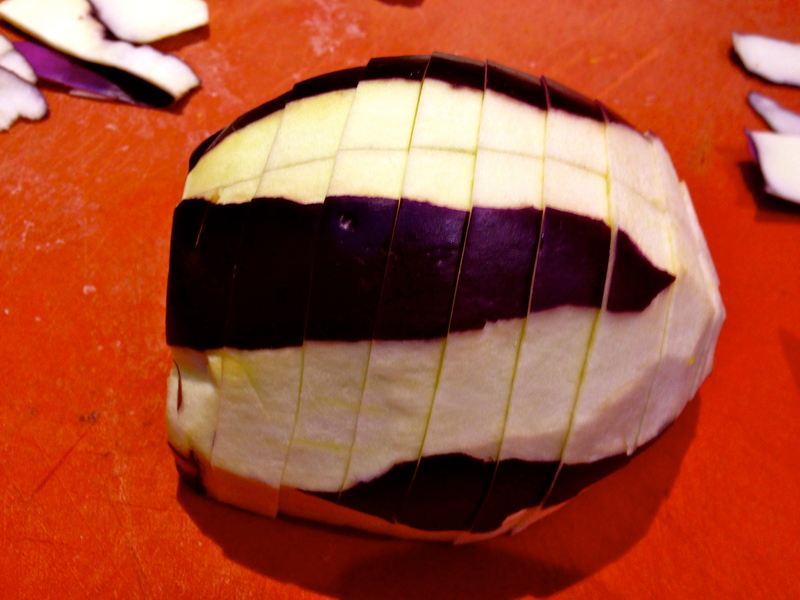 Instead of grating the peel, Chef taught us to slice and remove the white from a strip of peel and then cut it into slivers. This helps the zest maintain its flavour. A vanilla pod was scraped in and the mixture was combined. 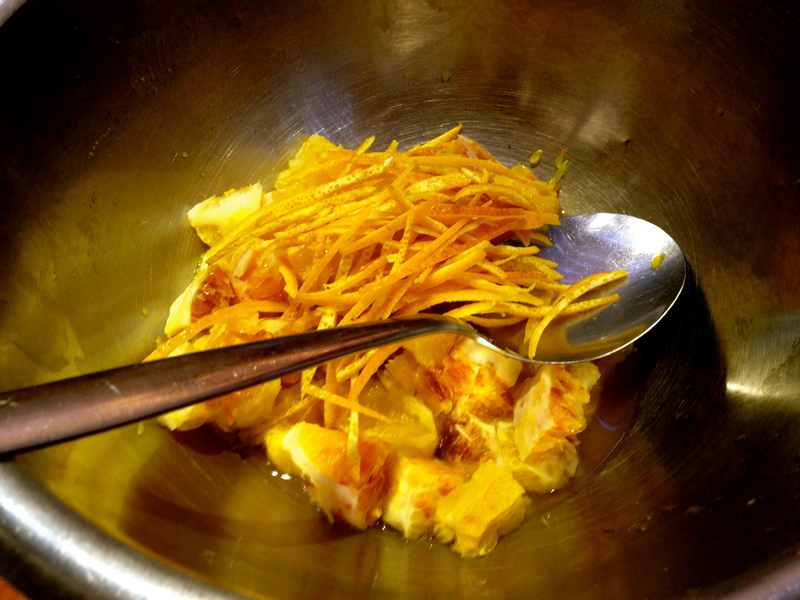 In a pot, Chef brought water and sugar to a boil and then added the orange pieces, juice and zest from the blood oranges. These were then fished out and left to cool. 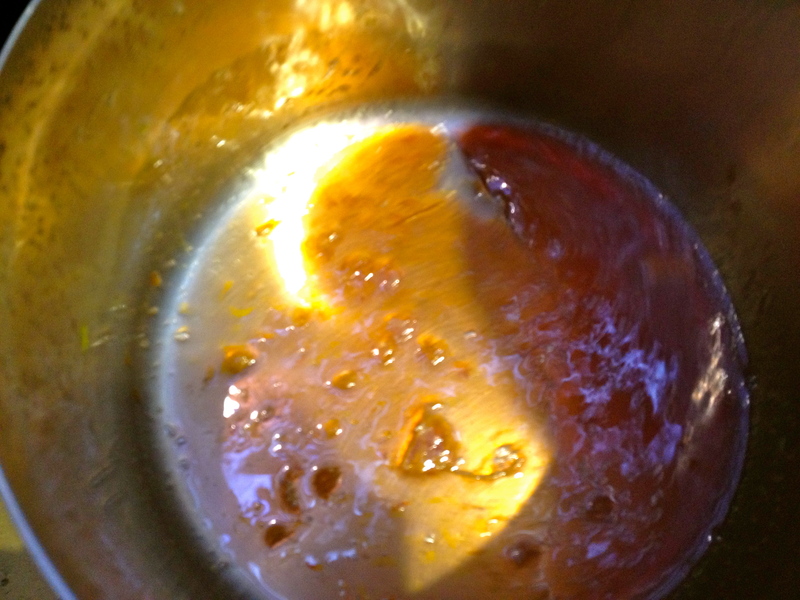 The mixture continued to simmer whilst we cooked and reduced down to a sweet, tangy marmalade like syrup to top the dessert. 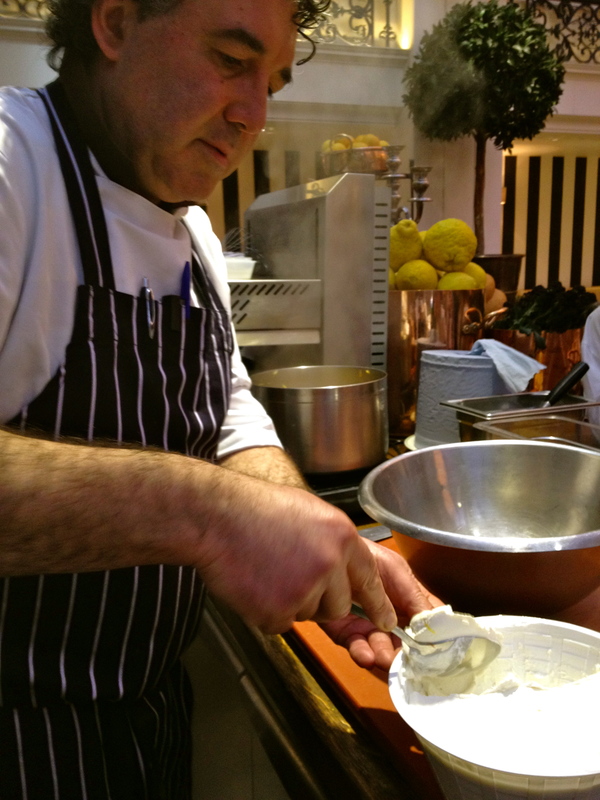 We then whipped together ricotta, double cream and icing sugar to create a fluffy, creamy base for the dessert. We layered the desserts with the cheese mousse, cooked orange segments and crushed pieces of amaretto cookies and then placed them in the fridge. 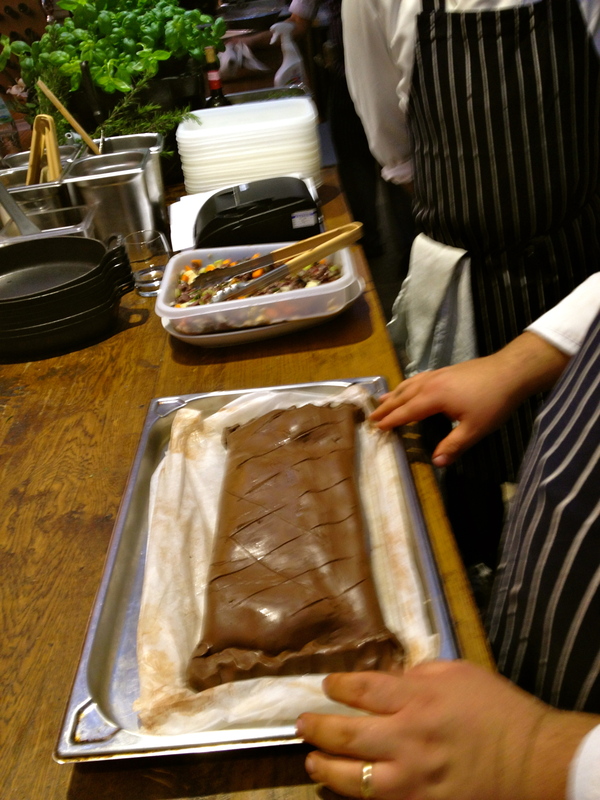 After hours in the kitchen, we gathered round the table to taste our creations. We started with the antipasti. 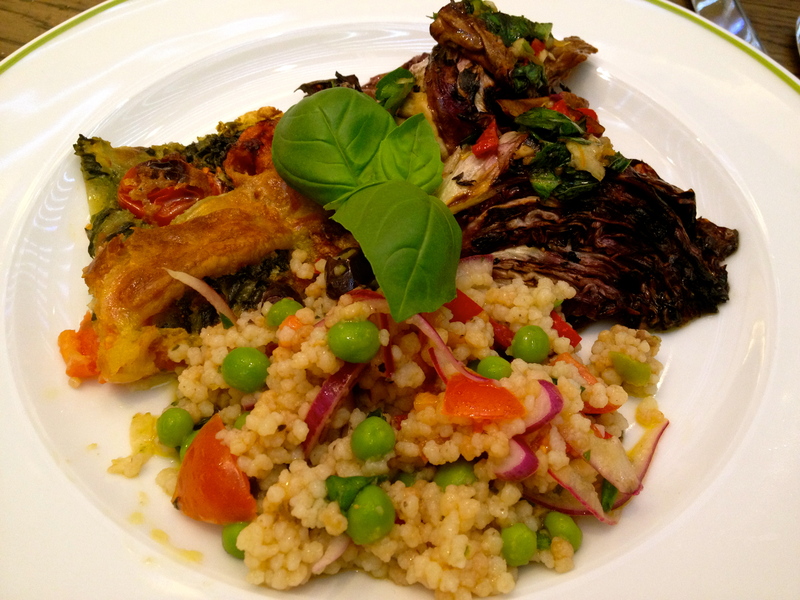 Marinated radicchio with oranges and honey balsamic vinegar, fregula salad with peas, mint and olives and Cavolo nero tart with pecorino cheese. Fresh bursts of flavour in every bite! 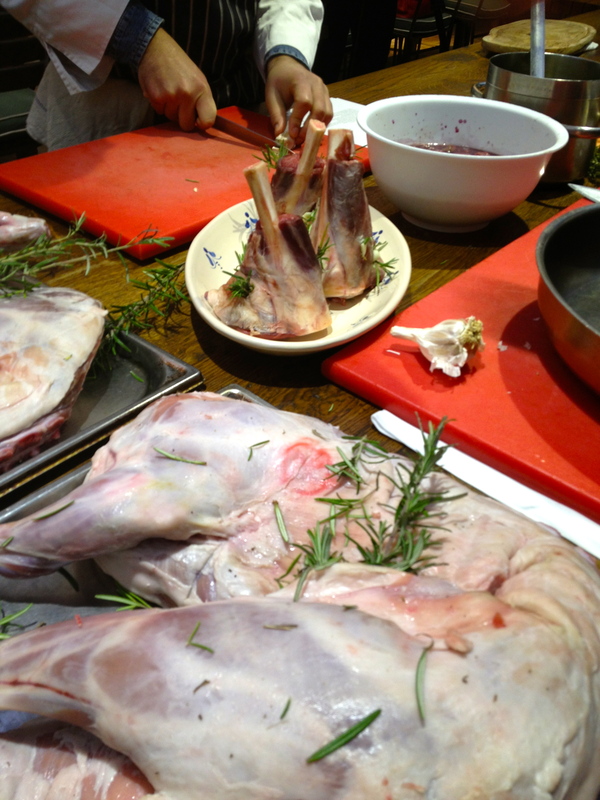 Whilst we nibbled away, the Chefs plated up a lamb feast fit for the kings. Platters and bowls of the three different types of cooked lamb were piled high before being brought to the table. 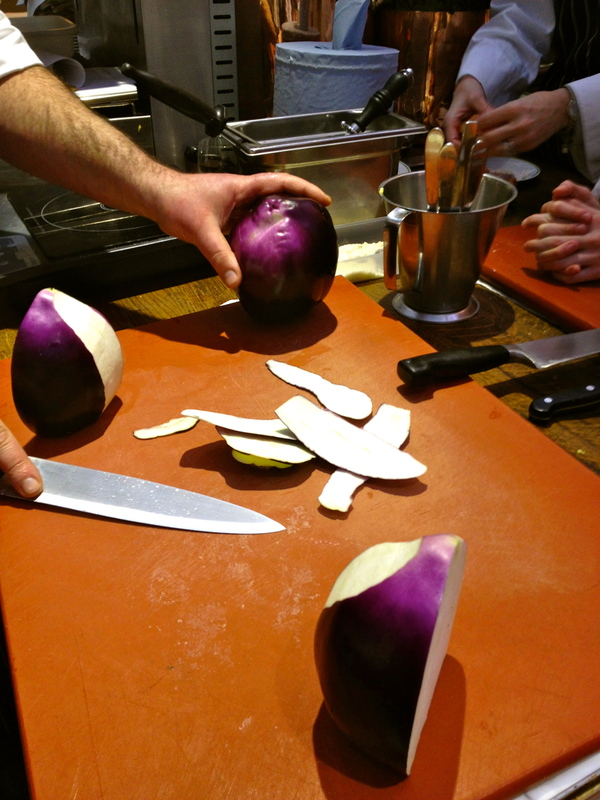 To accompany our lamb feast, we shared sides of pan fried aubergine salad and baked polenta with Taleggio cheese. These were absolutely delicious, if I do say so myself. To finish our feast, our Sicilian ricotta mousse with amaretto and orange was served in little Italian silver ice cream dishes. This was absolutely delicious, tangy and sweet from the orange, cookies and mousse topped with the incredible reduction. Now what I tell you next needs to stay between you and me. 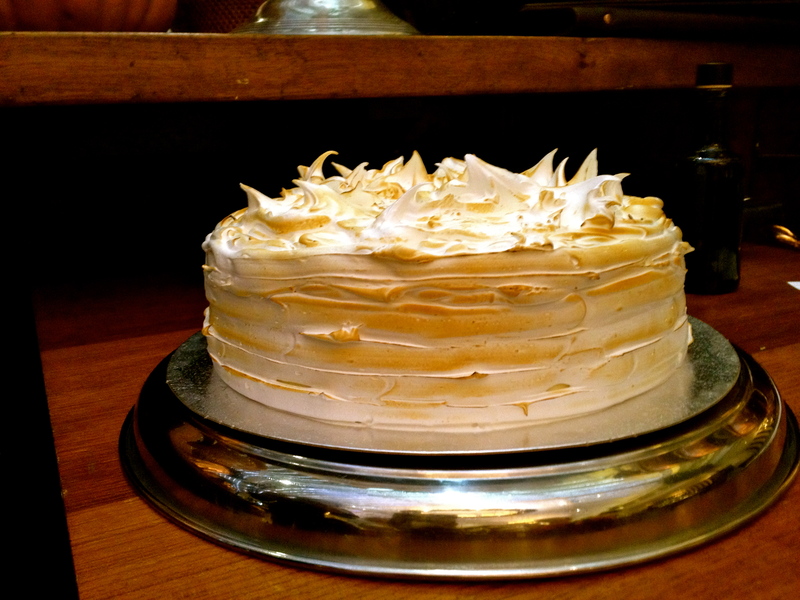 After polishing off my dessert, I spotted an enormous, stunning meringue looking cake sitting on a table behind me. The Sommelier spotted my greedy eyes and came over to tell me that this cake was “The Heartattack.” Apparently it is Arkady Novikov’s favourite dessert and is on the dessert menu of the restaurant. Jokingly I asked if there were any samples and he disappeared as I continued to laugh to myself. Thinking he was offended by my greed, I sipped my fresh mint tea in silence. Moments later, in front the entire table of stuffed foodies having eaten our weight in Italian dishes, this was placed in front of me. I was mortified and delighted simultaneously as everyone laughed. I took a bite and passed it around the table. My moment of shame was definitely worth it. 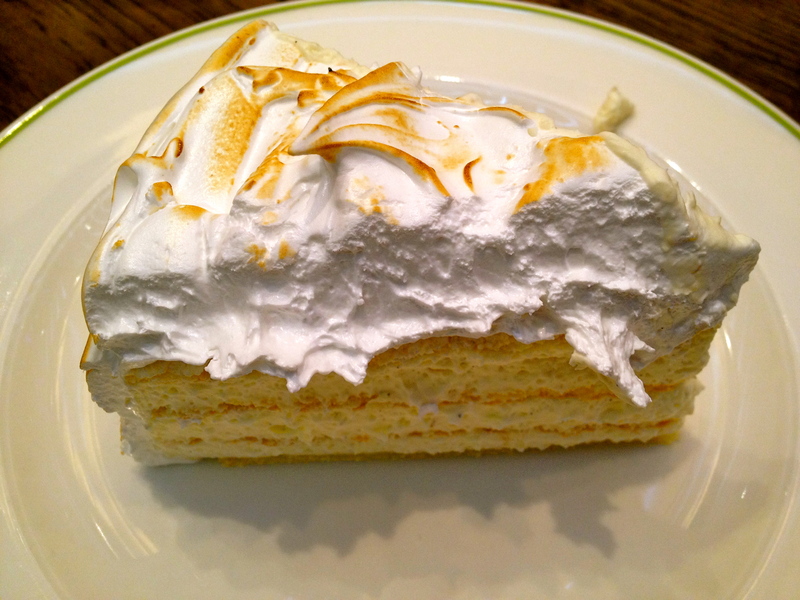 A bite of sweet, fluffy layers of Chantilly cream and meringue was like biting into a vanilla cloud. I fully understand why this is the Russian restaurateurs favourite dessert. It was an incredible day filled with great food and great people. I thoroughly enjoyed cooking a feast fit for the Kings and enjoyed even more getting to taste it all. Lucky for you, the class is now going to be offered on the last Saturday of each month. Grab a friend or family member, treat someone special, or spend the day getting to know yourself and the kitchen in this beautiful Italian room with incredibly talented Chefs leading the way. 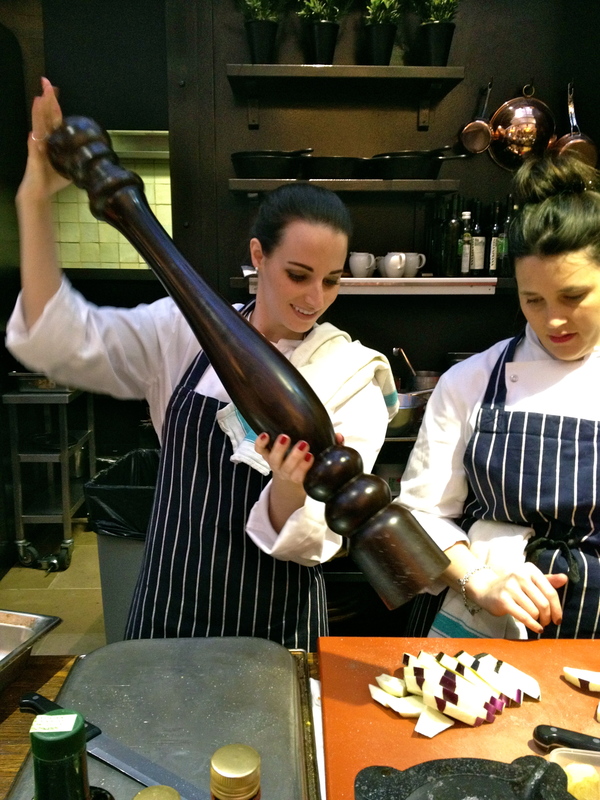 Don’t worry if you’re not the next Mario Batali, the Chefs will talk you through each step. Best of all, you’ll be asked to taste test along the way. 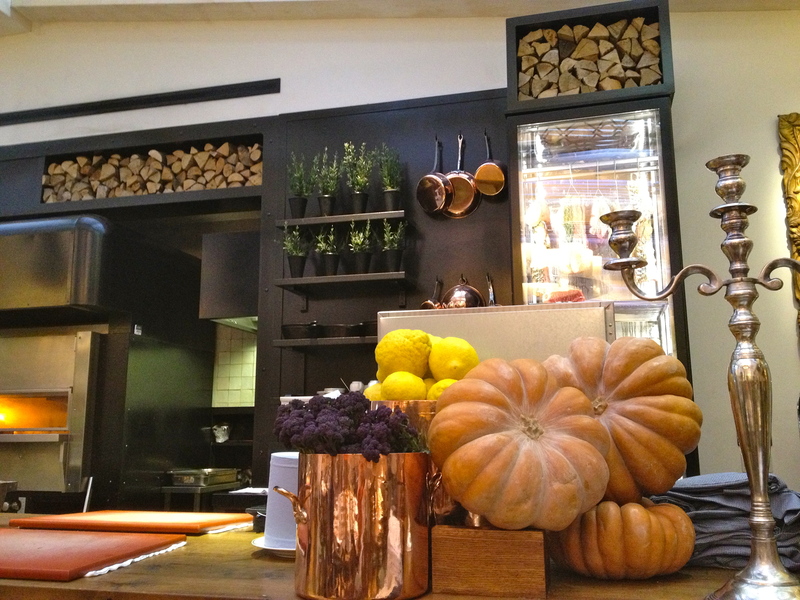 If you’d like to spend a Saturday in Chef Whites in this famous Mayfair haunt, book here. Give the lovely staff a call and I’m sure they’ll be happy to book you in. To see some behind the scenes action, click here for a video of the class. That would save me having to use sticky fingers to snap shots! Maybe some day in the future. My next trip to Europe will probably not be for about another year. We’ll see…. Wow this all looks amazing! I’m so jealous of the food you get to eat!